REDWOOD (GB) (Bay or Brown 2006-Stud 2012). 4 wins-1 at 2-from 1m to 1½m, Woodbine Northern Dancer Turf S., Gr.1. Sire of 101 rnrs, 56 wnrs, inc. SW Night's Watch (MRC Naturalism S., Gr.3), Rising Red, Romancer, SP Livin' on a Prayer, Rosewood, Swampland, The Heiress, High Mode and of Big Sur, Chamalu, High Sierra, I See Red, Red Sierra, Suliman, Tamarack, Woodloveto, Chief Sequoyah, Dashper, Haylin Rouge, Rakau Whero, Rock on Wood, etc. EL SEGUNDO (g. by Pins). Joint Head of the 2006-07 Australasian 4YO+ Classification. 12 wins from 1200m to 2050m, A$3,964,375, MVRC WS Cox P., Gr.1, MRC Yalumba S., Gr.1, Underwood S., Gr.1, CF Orr S., Gr.1, MVRC Dato' Tan Chin Nam S., Gr.2, Norman Carlyon S., Gr.2, MRC Memsie S., Gr.2, MVRC JRA Cup, L, MRC Nicopolis H., 2d MVRC WS Cox P., Gr.1, VRC Aurie's Star H., L, 3d MRC Futurity S., Gr.1, Yalumba S., Gr.1, VRC Aurie's Star H., L-twice, 4th MVRC WS Cox P., Gr.1, VRC LKS Mackinnon S., Gr.1, MVRC John F Feehan S., Gr.2, MRC Memsie S., Gr.2. Redondo Beach (g. by Elnadim). 4 wins from 1700m to 2500m, A$135,150, VRC Western Health Cup H., 2d MRC Winooka H., Wimmera RC Horsham Cup, 3d SAJC Gliderol Garage Doors H.
Big Sur (g. by Redwood). 3 wins. See below. El Catino (g. by Pins). 3 wins to 1550m in Aust. El Stupendo (g. by Pins). 2 wins at 1300m, 1500m in Aust. Cracking Tottie. Winner at 1600m in 2018, Singapore TC Kranji S.
The Snake (g. by Umatilla). Placed in Aust. PALOS VERDES (Oak Ridge). 10 wins. See above. No Limitations. 3 wins to 1200m in Aust. Grand Orator. 5 wins to 1500m, A$124,393, MRC (Mornington) Chadwick Grimmond Engineers H., Spiral Logistics P., 2d MVRC Sitetech Solutions H., 3d MRC Hyderabad Racing Club H.
Gisela. 2 wins at 1200m, 1400m, Matamata RC Jace Group H., 2d Hawkes Bay AON Insurance Brokers H., Waikato RC Warren Storm S., Rotorua RC Lance Lawson Barristers H., 3d ARC CBRE H., Simply Squeezed H., Co-Op Taxis H., Hawkes Bay AON Insurance Brokers H., Waikato RC Go Racing Syndications H., Hirepool Vehicles H., Newstalk ZB 97FM H., Te Aroha JC Super Liquor H.
Bang On. 10 wins from 1300m to 2100m, A$255,960, Toowoomba Cup, BRC Hidden Dragon at Lyndhurst H., Ormiston College H., Canadian Club H., 2d BRC Mittys P., 3d BRC Makers Mark H., Winning Edge Trophies H., Sky Racing H., 4th BRC Tails S., L.
Tinderbel. 3 wins from 1200m to 1600m, A$76,325, TRC Prime Thoroughbreds H., MRC (Mornington) Beleura Retirement Village H.
GOLD DECK (Decies). 8 wins-2 at 2-from 1000m to 2200m, A$166,330, VATC Norman Robinson S., L, Bendigo Cup, L, VRC Bradfield H., University Meat H., MVRC RV Moon H., 2d VATC Easter Cup, Gr.3, Ballarat Cup, L, VRC Brookside H., Grosvenor H., QTC Sir Douglas Wadley H., VATC Tommy Woodcock H., 3d STC Tulloch S., Gr.2, QTC Eagle Farm S., L, Bendigo Cup, L, VRC Carnival Welter, Exford H., VATC Bond H., 4th Victoria Derby, Gr.1, VATC Easter Cup, Gr.3, Ballarat Cup, L.
Raumancer (Otehi Bay). Winner. See above. In the Heavens. 7 wins from 1600m to 2200m, WATC Swan Premium Graduation S.
Teggun Chris. 7 wins from 1200m to 1600m, STC Canterbury Hotel H., Alfreds Associates H., 2d AJC Nile H., Peter Dawson H., 3d STC Laurel Oak Bloodstock H.
Mr Marumo. 15 wins-3 at 2-from 1000m to 2100m, A$181,100, Townsville TC Parry Nissen Great Northern 2YO H.
Race Record: 11 Starts 3-1-1 A$103,335. 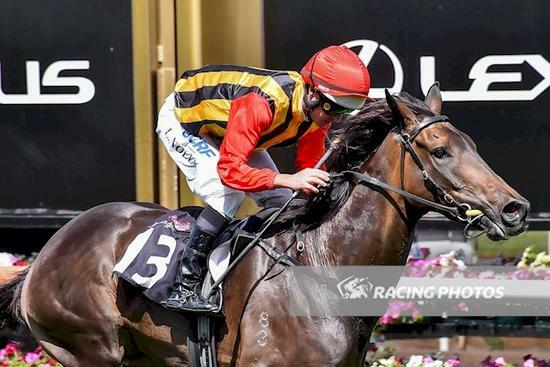 3 wins from 1600m to 2000m, A$103,335, to 2017-18, VRC JDRF Australia H., 3d MRC Tile Importer H.